Children are to a degree necessarily imbalanced. They are in a constant state of change. Children seek to discover the limits of their control over their environment. What has become known as childhood infectious illnesses are the training ground of achieving and maintaining balance in their life as an adult. The ability to react appropriately to stimuli is a learning process. If a child is challenged by microbes their body should react appropriately by producing a fever and the lymph nodes should be activated. When a fever occurs it must be understood that the child is already in the healing phase, not the illness phase! 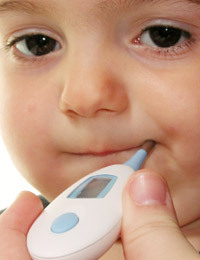 Physicians are seeing more and more children whose body will not generate a fever. In fact now more than ever children are manifesting diseases that were previously considered to be geriatric illnesses, in part due to the generations of drug-interventions from birth to old age. As a society, mankind is getting colder at the core body temperature, where normal body temperature was considered 98.6℉ it is common now that people have 96.5-97℉ as their baseline temperature. A temperature of 96.6 may not sound that bad, but consider if someone is exposed to harsh winter conditions hypothermia is 95℉ or below! That is just 1 degree colder than many children and adults in today's modern society! When considering mankind over the last one hundred years, it is easy to see that we are moving away from inflammatory illnesses which are marked by excessive fever and heat, and moving toward the cold feverless illnesses like multiple sclerosis, cancer, fibromyalgia, and chronic fatigue. It is suggested that mankind was more “full-blooded” in previous centuries. All illness is a result of imbalance. The body is not dumb and powerless when it succumbs to an infection. The body is wise and will often use an illness to shed old useless immaturity in the body, mind, and spirit. It often simply needs support in its efforts on all three of these levels in order to fully process through the illness. The ideal treatment is to facilitate the goals of the body in succumbing to the infection, and ultimately provide the building blocks and information the body, mind, and spirit need to fully mature. Doing so will restore balance and enable one to return once more to health. This statement is foundational to understanding healing any illness. Balance is not provided through vaccinations, pills, and injections, but through the thoughtful support of our infants as they progress through childhood developing not only physiological balance, but also mental, emotional, and spiritual balance as they are forced to progress and morph through the very necessary illness training process towards full maturity on all levels. Training for balanced living in an ideal world does not begin at the birth of your child. In an ideal world it begins over the course of the previous seven generations living and teaching their offspring these concepts of high integrity in body, mind, and spirit. In this way, your child is born fully capable to set his own course without having to deal with inherited weaknesses on any level. Then your child will pass through predictable seven-year cycles of development, which continues most importantly throughout the first twenty-one years. From then on we all apply our training as we meet the challenges of life. We have been sold swampland in Florida, by well-meaning health care professionals who taught us all to spend our entire lives, from birth onward, trying to avoid illness through artificial means. According to the World Health Organization statistics, the “health conscious” people of the United States, use the most drugs, vitamins, have the most doctors per capita, are blessed with almost the worst health of all the countries in the world. Billions of dollars are spent annually trying to overcome illness. It is well known that 88% of those billions is spent on symptom relief. How do we stop the vicious cycle? It is estimated that 80% of a family’s health care choices are made by the Mothers. Mothers must take this information to heart and seek out doctors who support these natural principles. Husbands must also be unified with their wives and be somewhat educated in this topic as well, so that the entire family can always be in agreement and unified. The last thing that needs to happen is for illness to be causing discord in families. A monumental shift in our thinking is required if we are to redefine the role of illness in our lives. Illness reflects a state of imbalance somewhere in our life. This is one of those times that the “Body, Mind, Spirit” connection must be accepted in order for the law of imbalance can be fully appreciated. Optimum health is achieved by maintaining proper balance between your body, mind, and spirit. Being out of balance in any of these areas promotes illness. Let’s break this down into its component parts. When the body is not properly nourished, protected, or when sanitary conditions are not maintained, illness can set in. When the mind is allowed to overwork, become depressed, or emotions are suppressed, illness can set in. When the spirit is broken, lost, confused, or misguided, illness can set in. Each of the body, mind, and spirit are interdependent and therefore one cannot be in a state of imbalance without effecting the others. Illness is then nothing more than a sign of the particular imbalance, no matter what disease name we attach to it. It is vital for men and women to practice balance long before deciding to have children. The establishment of balance begins in the sperm and ova. The union of these creates a being who must rely on this combined balance of the parents until it is born. At birth there is a transition, a shifting from a shared circulatory system, neurological system, and immune system to an independent system that will be required to hit stages of awakening and development to find its own unique balance. What we consider to be “Childhood illnesses” are developmental cycles. As the child grows it must pass through these developmental stages in preparation for continued growth, survival, and maturity. When I think about these developmental stages of childhood, I am reminded of the early Mercury space rockets. For those of you who remember watching the first rockets to the moon, on black and white TV's, it was something that no one had seen before. It was a bit frightening to me as a child watching this momentous occasion! There was the initial blast off which at first seemed that possibly something went wrong, with all of the fire, blast, and smoke, but slowly at first the rocket lifted off the launch pad. It gained in speed, shooting straight up, then it began to lean, and for a moment you thought it might loop over and plunge into the earth, but it kept going up. After the initial rocket thrusters were used up, another moment of panic occurred as it seemed that half the rocket exploded and fell off, but this too was a controlled and anticipated chaos, as the next stage rocket thrusters took over. Finally, the space capsule establish the correct altitude and began a balanced orbit, not going up and not coming down. The capsule seemed to be the picture of peace and tranquility, its mission finally achieved. Balance between inner and outer space. Now we have all seen many rocket launches on TV and it is hardly news worthy to many people. This is how we should feel about childhood fevers that are handled correctly, working with the natural healing of the body, recognizing that the fever indicates that the child is already in the healing phase, not the illness phase. To suppress the fever is to suppress healing! So with this in mind, consider now that childhood maladies such as mumps and measles, and chicken pox, the falling down and the getting up again of the toddler, the emotional ups and downs as the ego develops, and the cracking of the voice, and growing pains, are all controlled chaos designed to be stages of development for the ultimate goal of establishing the full maturity of the individual. They are the breaking away of the rocket thruster to the end that its unique destination is achieved. This all sounds good and fine you might be saying, but ‘what are we supposed to do when our child is sick?’ Shouldn’t we vaccinate our kids so we can spare them the pain of these illnesses? To answer these questions lets continue with our rocket analogy. What do you suppose would happen if we just kept the first and second stage rocket thrusters attached to the capsule? It might eliminate the fear of something going wrong during their separation from the capsule, but even if the capsule were to reach orbit it would be clumsy to navigate and its balance would be off. Perhaps it would not be able to maintain the correct orbit. Childhood illnesses are a necessary event that should not be avoided. Providing the natural remedies and therapeutic support for the body is all that is needed. Understand childhood illnesses for what they are, developmental stages that are preparing the child for the challenges of achieving and maintaining balance later in life. In an otherwise balanced life, these childhood illnesses are normally non-life threatening. Thank you for always being the voice of reason and common sense. We are destroying our children (and pets) with vaccinations, medications, mental stress and lack of exercise.